FITC conjugated Mouse anti Canine CD3, PE conjugated Rat anti Canine CD4 and A647 conjugated Rat anti Canine CD8 (TC014). All experiments performed on red cell lysed canine blood gated on mononuclear cells. Anti Dog CD3:FITC/CD4:RPE/CD8:Alexa Fluor® 647 is a triple color reagent recognizing canine CD3, CD4 and CD8 cell surface antigens. 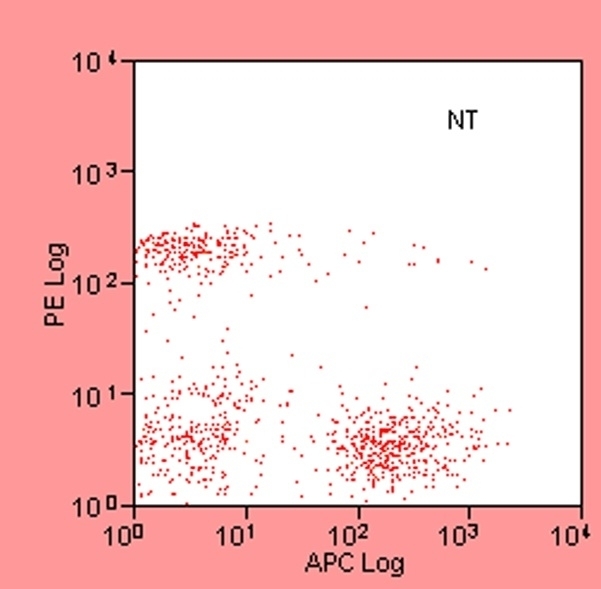 Clone CA17.2A12 recognizes canine CD3, which is expressed by T lymphocytes. Clone YKIX 302.9 recognizes canine CD4, which is expressed by lymphocyte subsets and canine neutrophils. Clone YCATE 55.9 recognizes CD8 alpha, which is expressed by cytotoxic T cells.